Nissan, having long promised a Leaf with a longer range, is now making good on that promise with the reveal of the leaf 3.Zero e+. The new model gets a bigger battery (62kWh compared to the standard model's 40kWh) and a longer range. Nissan currently claims that range to be 385km, although the new car has not yet been through the official WLTP test. It's a longer range than that of the current Leaf, but is crucially shorter than rivals from Hyundai and Kia. Nissan says that it's a 40 per cent increase in range over the existing Leaf, roughly an extra 100km. Only 5,000 of this limited edition e+ model will be built, at first. There will also be a new Leaf 3.Zero model that retains the standard 40kWh battery pack, but which benefits from other upgrades including a new eight-inch infotainment screen and new internet connectivity options. Interested customers can put their names down for one from this month in Europe, but Nissan Ireland says that it will be a 192-registration model here, arriving in the summer. As well as the bigger battery, the 3.Zero e+ gets a bigger electric motor, which sees power boosted to 217hp, and torque climbs to 340Nm. The battery pack is virtually the same size as that for the 40kWh model, but packs in 288 power cells, compared to the current 192 cells. That represents a 25 per cent increase in power density, and a 55 per cent increase in total storage capacity. The only physical change to the car is that it now rides a little higher - by 5mm - to accommodate the extra weight. 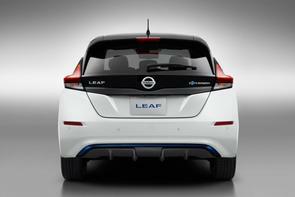 The e+ Leaf's top speed rises (by ten per cent) to 156km/h, while the 80-120km/h sprint time is cut by 13 per cent. Both 3.Zero models come with the same e-Pedal system as the standard Leaf (which allows you to drive and slow to a complete stop without using the brake pedal, assuming you've judged your gap to traffic in front correctly) and the ProPilot automated driving assistant, which helps you stay in your lane, keeps you a safe distance from the car in front and which can creep in heavy traffic for you. Nissan seems keen to make the point that this is a 'hands-on, eyes-on' system that requires the driver to pay attention and remain in control at all times.